With the holidays over and 2019 in full swing, moms are focused on fueling their kids for a healthy rest of the school year. 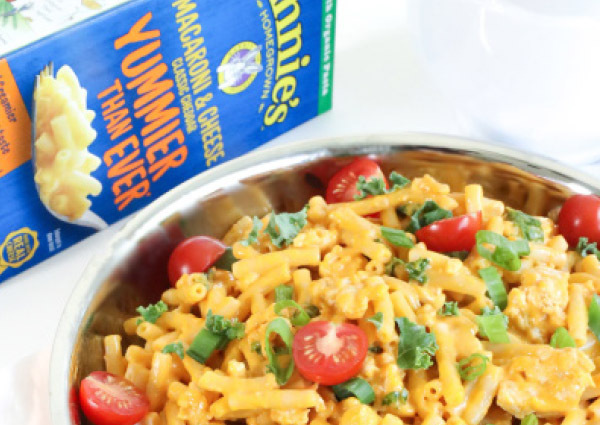 Annie’s gives mom delicious food that her kids will actually want to eat – and that she can feel good about too! Their wide variety of organic soups, mac & cheese, and fruit snacks makes refueling anything but boring. When moms choose organic food, they are caring not only for their family’s health and wellness, but that of the planet and everybody on it. Fruit Snacks… Made with Goodness! 1.Make mac & cheese according to package directions. 2.Brown turkey in a large skillet. 3.Add ketchup, onion powder and garlic powder. Stir well. 4.Add mac & cheese to the turkey mixture, mixing until fully combined. Stir in tomatoes and kale. 5.Serve warm garnished with green onions, if desired.